Fears and suppressed anger can consume enormous amounts of energy. Many people will find that by integrating experiences from the past, with a balanced approach, using our mind, body & spirit, we can heal the 'masculine self' and take appropriate action for the soul's evolution. This formula is also to help with work productively for long periods of time. It helps with issues of claustrophobia, or being stuck in a conference hall with intense overwhelming information or energies. Lightly scented with organic peppermint and a touch of sandalwood. I get really claustrophobic in a class room environment during workshops or teaching events. It almost feel like a huge head ache descends on me, and then it leaves as soon as I get outside into the fresh air. On the second day of a training, I used the Energize Spray because I happened to have it on me. I felt reluctant to go back into the room for the course I paid good money to do, but wanted to be there badly, so. I sprayed the Energize spray over my head a few times over the three hours of sitting and I didn't get that awful heavy headed feeling or claustrophobic symptoms. It was quite amazing. Since then, I dont do so badly as before in closed rooms, but I do take my spray with me if I remember, just in case! In base of: Structured Blessed water, Grapefruit seed extract and Love! 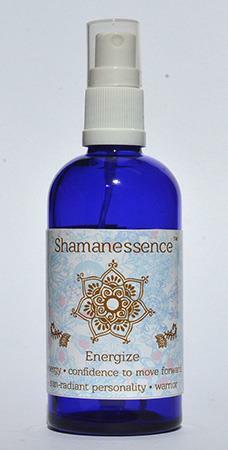 Spray over head, around aura/body or specific energetic areas/chakras, etc.